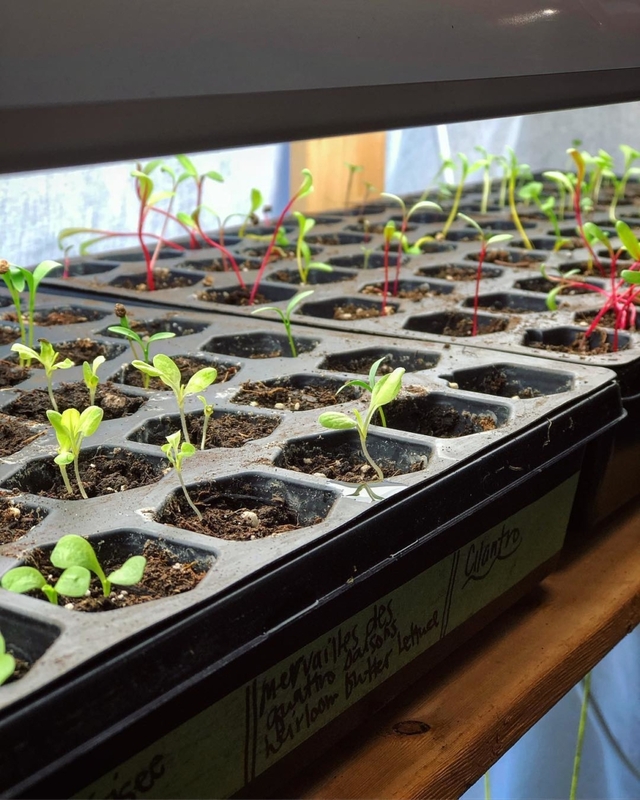 Blog IG: 2019 setup: I’m using some additional florescent lighting on my seedlings this year for the first time ever. In the past I have only used window light but on super sunny days when fragile seedlings get blasted with full, hot sunshine, it isn’t ideal. I’ve accidentally cooked some for sure, even this year already 🤷🏻‍♀️. Also, I was too cheap/lazy to set up a lighting system in our old house, but the original owners of this new place left us with a bunch of florescent lights that are actually great for this. So, why not try? I have still placed them in a window but am diffusing the natural light with a tight mesh-like shower curtain I bought at yesterday. Every year is truly an experiment but every year I definitely gain a deeper understanding and become more efficient. Thanks to Jeff for putting up with my growing obsession as I take over a large area of our walkout basement to do this... until we build that greenhouse 😙. Also I have nowhere to actually plant any of these yet so this will be interesting 😅. Send help. IG: 2019 setup: I’m using some additional florescent lighting on my seedlings this year for the first time ever. In the past I have only used window light but on super sunny days when fragile seedlings get blasted with full, hot sunshine, it isn’t ideal. I’ve accidentally cooked some for sure, even this year already 🤷🏻‍♀️. Also, I was too cheap/lazy to set up a lighting system in our old house, but the original owners of this new place left us with a bunch of florescent lights that are actually great for this. So, why not try? I have still placed them in a window but am diffusing the natural light with a tight mesh-like shower curtain I bought at yesterday. Every year is truly an experiment but every year I definitely gain a deeper understanding and become more efficient. Thanks to Jeff for putting up with my growing obsession as I take over a large area of our walkout basement to do this… until we build that greenhouse 😙. Also I have nowhere to actually plant any of these yet so this will be interesting 😅. Send help.